Ailsa’s travel-themed photo challenge this week is Big. For more on this subject see At the Bottom of the Food Chain. This entry was posted in Kayaking, New York City, Photography and tagged Barges, Big, Kayaking, New York Harbor, Photography, postaweek, postaweek2013, Travel, Weekly Photo Challenge. Bookmark the permalink. Nice photo. Keep up the good work! Love this photo. I almost put a image up of an aircraft carrier but the perspective of all the shots I had didn’t do the size justice. I guess I need to get down on the water like you. That’s a big tug too! 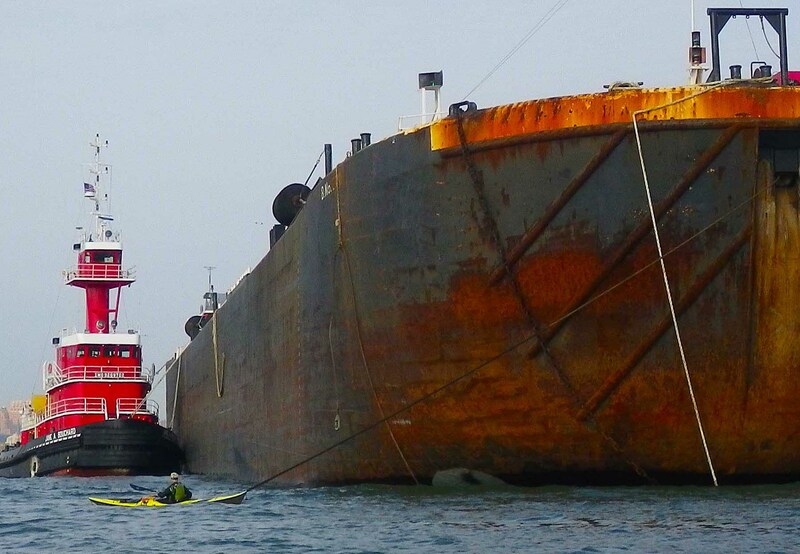 Oh, my, even bigger when it’s aiming at your kayak, I imagine! Love this, 3 sizes of boats – great shot!! that could be quite scary up close vlad! We had similar thoughts on B I G : ) Nice ! I am way behind on my email!